You've heard of houseguests emptying your refrigerator? Well, this is a new one for me. My mom is visiting, and she's kind enough to offer babysitting in exchange for hours of griping. 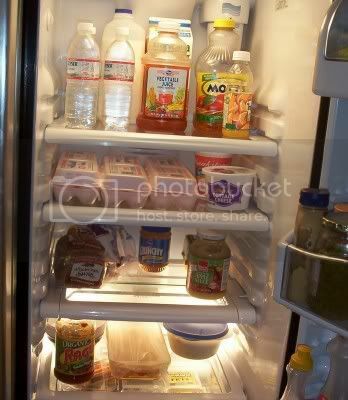 In her opinion, my refrigerator is always barren because it lacks individually packaged products like pudding snacks, hot dogs, and chocolate milk. She decided to take action while I did preschool yesterday morning. I do wait until Thursdays to clean the fridge--garbage day is Friday, and I don't like old food to tempt neighborhood dogs any earlier than necessary. But what she threw out? A whole gallon of freshly mixed powdered milk, because it was mixed in a jug labelled two weeks ago. A quart of expensive breakfast drink, likewise mixed in a recycled container. Two cartons of eggs, newly hardboiled but stored in older cartons until I peeled them. Both loaves of Pepperidge Farm bread, from the freezer stock bought in February. A package of chicken breasts thawing for dinner. And the very worst? Four jars of homemade yogurt, including the jars themselves. "Too much trouble to wash."
It's a good thing she brought me so many bottled waters and cans of vienna sausages to compensate. Ah, mothers. They never quite give up treating us as know nothing children do they? In my opinion, she could have at least asked before throwing all that good stuff out. Vienna sausages....ewwww. High sodium levels aren't good for anyone, especially pregnant women. Did you happen to watch the American Inventor show last night? We did and thoroughly enjoyed it! Well ... that would have been frustrating! I think you're dealing with this a lot better than I would have. I can't see my mother doing this, but my MIL? Very possibly, and she'd have good reasons to do, but she'd bring chips and chocolate all the while talking about her diet. Oh, how maddening! I almost divorced my husband (well, not quite) for throwing out half a jar of homemade spaghetti sauce, so I can't even imagine how upset I'd be about a fridge full of perfectly good food! I really shouldn't complain, because she's always offering to babysit--which is of course worth far more than the value of the food. It's just the principle of the matter! And no, the Vienna Sausages were tucked back into her car before she left for the day. Just an example of the many convenience foods she thinks are so great and constantly brings to my house. Terri, I did like the American Inventor show! I hope some of the other inventions turn out to be more useful. I have read one of the books by Doug Hall and enjoyed it, so I'm looking forward to hearing more from his perspective. Sounds like you handled it with love and grace. Amazing! I would have been livid.